brick underpinning or repairs to brickwork wall foundations. Underpinning the concrete foundations of brickwork walls. Brick underpinning for short..
A series of holes are drilled along the length of the existing foundation. Some hand working is done to create a bearing surface under the old foundation. Say every second or third one is partly filled with concrete. After the concrete in these holes is set a small but powerful hydraulic jack is used to lift the existing foundations. The machine that augers the holes, quite often has the jack as an accessory and it is drive by a hose connected to the machine hydraulic system. The gap is packed with steel packers and the jack withdrawn and used again. When the correct height is reached and the foundation securely packed they are filled with mass concrete, or with a re-bar cage and concrete. Traditional method, supporting a brickwork wall. 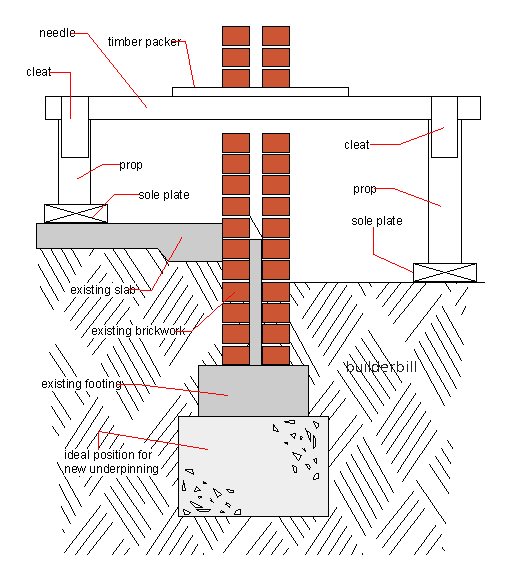 Brick Underpinning - A section through a brick wall showing the method of supporting it with needles and props. What follows are details of brick underpinning a wall by older methods. You may ask why bother when newer methods are better? Well you may not have modern machinery available, or you may not have enough access for a machine. It could be an internal wall that needs brick underpinning. We need to take the weight off the wall, to support it in another way while the underpinning work is being done. The sketch above shows an old way of doing this, using timber. The same principle applies when using steel props and needles. The needle itself is the part that goes through the wall and it is always a compromise. The shorter it is, the more load it can carry for a given section (size). The longer the needles are then the more room to work. If steel needles are used, always use a timber packer between the steel and the brickwork. This compresses and lets the bricks sit on a broad area. Steel directly masonry could feel solid but it could be sat on a dag of mortar that could turn to dust if load is applied. Sole plates, wide pieces of timber are essential to hold the props and to spread the load. This type of propping is very similar to propping for concrete formwork, so I won't go into detail here, maybe you would like to see my concrete pages for details of bracing etc.. Above I have shown the inside props supported by the floor slab, but sometimes if this is also in a bad condition, then the slab has to be cut out and the load taken by the soil inside. In this case it may be advisable to compact the soil by mechanical means before using it to support a large wall. Lets say that this is a two storey gable end wall. It obviously depends on the extent of the movement that has already happened, but I would also be thinking about a few raking shores to support the wall, room permitting. Using steel props or scaffold pipes the cost could be very reasonable compared to the other option of loosing a large section of wall. Traditional method, excavation and pouring. 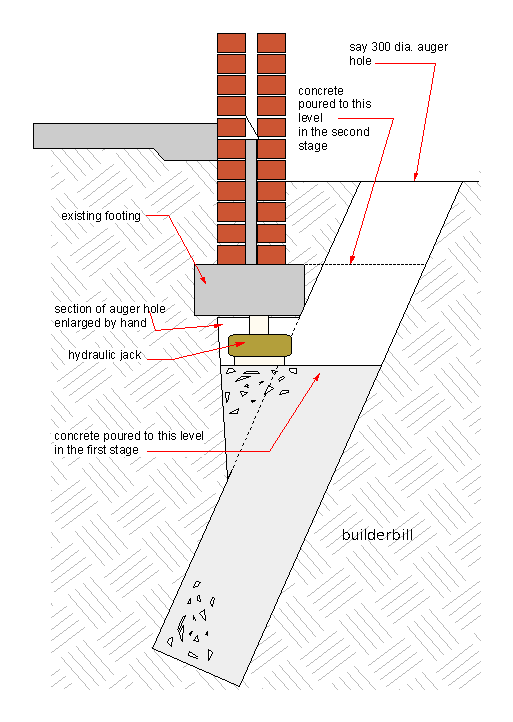 Brick Underpinning - The excavation and pouring concrete sequence. I can't think of any circumstance that would allow anyone to try underpinning the full length of a wall, and then pour the concrete in one hit. The work has to be done in sections. Once again it is a compromise between time and cost on the job, offset against safety. A practice that I have applied to dozens of situations when doing contracting work is to run through the "best case - worst case" scenario. For a job like this I think on these lines. "What is the best that can happen if I excavate under the wall in six metre sections ?" I save "X" amount of cash, we finish the job two or three days earlier, the customer is happy. "What is the worst that can happen if I excavate under the wall in six metre sections ?" It is literally unthinkable, a wall collapse, a man trapped in a trench under the rubble of the wall. All other considerations pale into insignificance. So here I can't say how far apart to do each section, whether to prop or not prop, etc. Each job is different, but safety should always be the main concern. In certain case this could work very well, it is easier to do and a lot safer than the previous method. It all depends on the job. We did similar pad foundation like this increase the strength of houses to resist uplift forces on the roofs, when the cyclonic building code came into being. Other methods of underpinning are in my new glossary section. Leave this brick underpinning page and back to home..